Discovering molecular pathways underlying healthy ageing for prevention, diagnosis, and treatment. The molecular basis of aging and of aging-related diseases is being unraveled at an increas-ing pace. More recently, a long healthspan is seen as an important goal. However, a precise definition of health and healthspan is not straightforward, and the causal molecular basis of health “per se” is largely unknown. Here, we define health based on diseases and dysfunc-tions. Based on an extensive review of the literature, in particular for humans and C. elegans, we compile a list of features of health and of the genes associated with them. Clusters of these genes based on molecular interaction and annotation data give rise to maps of health-span pathways for humans, featuring the themes transcription initiation, proliferation and cho-lesterol/lipid processing, and for C. elegans, featuring the themes immune response and the mitochondrion. Overlaying healthspan-related gene expression data (describing effects of metabolic intervention associated with improvements in health) onto the aforementioned healthspan pathway maps, we observe the downregulation of Notch signalling in humans and of proliferation/cell-cycle in C. elegans; the former reflects the proinflammatory role of the Notch pathway. Investigating the overlap of healthspan pathways of humans and C. elegans, we identify transcription, proliferation/biosynthesis and lipids as a common theme on the an-notation level, and proliferation-related kinases on the gene/protein level. Our literature-based data corpus, including visualization, is available as a reference for future investigations, at http://www.h2020awe.eu/index.php/pathways/. The roundworm C. elegans is a mainstay of aging research due to its short lifespan and easily manipulable genetics. Current, widely used methods for long-term measurement of C. elegans are limited by low throughput and the difficulty of performing longitudinal monitoring of aging phenotypes. Here we describe the WorMotel, a microfabricated device for long-term cultivation and automated longitudinal imaging of large numbers of C. elegans confined to individual wells. Using the WorMotel, we find that short-lived and long-lived strains exhibit patterns of behavioral decline that do not temporally scale between individuals or populations, but rather resemble the shortest and longest lived individuals in a wild type population. We also find that behavioral trajectories of worms subject to oxidative stress resemble trajectories observed during aging. Our method is a powerful and scalable tool for analysis of C. elegans behavior and aging. Human longevity continues to increase world-wide, often accompanied by decreasing birth rates. As a larger fraction of the population thus gets older, the number of people suffering from disease or disability increases dramatically, presenting a major societal challenge. Healthy ageing has therefore been selected by EU policy makers as an important priority (http://​www.​healthyageing.​eu/​european-policies-and-initiatives); it benefits not only the elderly but also their direct environment and broader society, as well as the economy. The theme of healthy ageing figures prominently in the Horizon 2020 programme (https://​ec.​europa.​eu/​programmes/​horizon2020/​en/​h2020-section/​health-demographic-change-and-wellbeing), which has launched several research and innovation actions (RIA), like “Understanding health, ageing and disease: determinants, risk factors and pathways” in the work programme on “Personalising healthcare” (https://​ec.​europa.​eu/​research/​participants/​portal/​desktop/​en/​opportunities/​h2020/​topics/​693-phc-01-2014.​html). Here we present our research proposal entitled “ageing with elegans” (AwE) (http://​www.​h2020awe.​eu/​), funded by this RIA, which aims for better understanding of the factors causing health and disease in ageing, and to develop evidence-based prevention, diagnostic, therapeutic and other strategies. The aim of this article, authored by the principal investigators of the 17 collaborating teams, is to describe briefly the rationale, aims, strategies and work packages of AwE for the purposes of sharing our ideas and plans with the biogerontological community in order to invite scientific feedback, suggestions, and criticism. Research into ageing and its underlying molecular basis enables us to develop and implement targeted interventions to ameliorate or cure its consequences. However, the efficacy of interventions often differs widely between individuals, suggesting that populations should be stratified or even individualized. Large-scale cohort studies in humans, similar systematic studies in model organisms as well as detailed investigations into the biology of ageing can provide individual validated biomarkers and mechanisms, leading to recommendations for targeted interventions. Human cohort studies are already ongoing, and they can be supplemented by in silico simulations. Systematic studies in animal models are made possible by the use of inbred strains or genetic reference populations of mice. Combining the two, a comprehensive picture of the various determinants of ageing and ‘health span’ can be studied in detail, and an appreciation of the relevance of results from model organisms to humans is emerging. The interactions between genotype and environment, particularly the psychosocial environment, are poorly studied in both humans and model organisms, presenting serious challenges to any approach to a personalized medicine of ageing. To increase the success of preventive interventions, we argue that there is a pressing need for an individualized evaluation of interventions such as physical exercise, nutrition, nutraceuticals and calorie restriction mimetics as well as psychosocial and environmental factors, separately and in combination. The expected extension of the health span enables us to refocus health care spending on individual prevention, starting in late adulthood, and on the brief period of morbidity at very old age. "Undoing Aging 2018" in March in Berlin, Germany. AwE presents a poster at "Pushing the Limits of Healthspan and Longevity" in April 2018 in Hanover, Germany. Journal of Biogerontology Aug 2016. Food Science & Nutrition July 2016. NEW publication: Does Longer Lifespan Mean Longer Healthspan? F1000 Faculty Reviews. 2016 Apr 29.
a Distinct Secretory Phenotype Cell Metabolism, February 9, 2016. 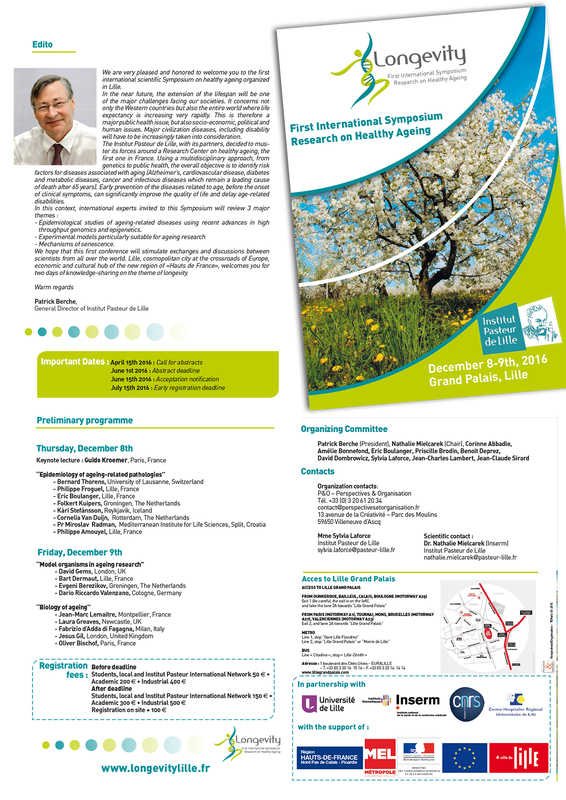 Publication: Healthy aging: The ultimate preventative medicine Science, December 4, 2015. Publication: Mitochondrial Quality Control via the PGC1α-TFEB Signaling Pathway Is Compromised by Parkin Q311X Mutation But Independently Restored by Rapamycin The Journal of Neuroscience, September 16, 2015.
on “Healthspan, Lifespan and Well-being: Definitions and Pathways”. The Future of Aging: IAGG-ER’s 10th European Congress of Biogerontology. December 8-9, 2016, Grand Palais, Lille, France. The 2nd edition of the International Symposium entitled Biology of Aging: Paving the way for healthy aging. Wednesday, October 19 and Thursday, October 20, 2016. Oxygen Club of California 2016 World Congress: “Redox Medicine and Nutrition”. Rostock, 26.-27. November 2015, Thursday afternoon 16h until Friday afternoon 16h.